Opposition leader Raffi Hovannisian, who went on hunger strike last Sunday as part of his current protest against the outcome of the February 18 presidential election, has accused the presidential administration of lying about his response to a proposed meeting. 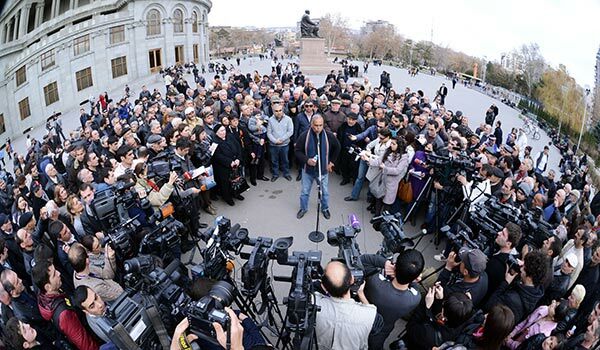 At a Monday evening press conference in Yerevan’s Liberty Square, the venue where he is holding his protest action, the 53-year-old candidate who claims to have been robbed of victory in the election officially won by incumbent President Serzh Sargsyan, insisted that he did not reject the proposal of the presidential administration for a meeting with the president. He said that the proposal was made by Chief of Presidential Staff Vigen Sargsyan (no relation to the president) in a phone conversation with Heritage Party representative Armen Martirosyan. Hovannisian made it clear that he wouldn’t meet with President Sargsyan in his office anymore, he was still ready to receive him in the square. (The presidential spokesman earlier said that Hovannisian had declined the proposal). Hovannisian and Sargsyan met on February 21 when the Heritage party leader personally went to the presidential compound. After the meeting, however, the opposition leader said that President Sargsyan had rejected all of his proposals. After that, during his rallies he periodically spoke about his readiness to meet with the president again anywhere, including in his office, in order to discuss ways out of the situation. But now, after he started his hunger strike, the opposition leader rules out his going to the president’s office again for talks. “The next time I go there will be as an elected representative. I myself went there and stated my readiness to go again, but now mutual willingness and readiness is needed to recognize the victory of the people, to overcome this national chasm. And until now I have received zero, none [response] from Mr. Sargsyan. This is already his opportunity for a sober assessment of the situation,” said Hovannisian. Statements and comments being heard from the ruling Republican Party of Armenia (RPA) led by President Sargsyan mainly qualify Hovannisian’s hunger strike as a provocation aimed at destabilizing the country. At the same time, senior RPA member Galust Sahakyan does not rule out that Sargsyan may visit Hovannisian. “Whether he visits or not, I don’t think that it will feed the people... Of course, if the public needs that, then the president is tolerant of it, as much as needed,” said Sahakyan at a press conference. Meanwhile, Hovannisian, who demands that Sargsyan “recognize the victory of the people and hold new elections” and is also disputing the election results also at the Constitutional Court, declared that he was ready to stay in Liberty Square until April 9, the day of presidential inauguration, waiting for Sargsyan’s “withdrawal”. “And on April 9, after long pangs, a New Armenia will be born,” said Hovannisian, without elaborating. And while Hovannisian is waiting for Sargsyan, he is being visited by various public and political figures, scholars and intellectuals. Among those who visited him on Monday were Prosperous Armenia Party (PAP) representative Vartan Oskanian, Hanrapetutyun Party leader Aram Sargsyan, People’s Party of Armenia Chairman Stepan Demirchyan, former Speaker of Parliament Tigran Torosyan, Republican MP Margarit Yesayan, Armenian National Congress lawmaker Nikol Pashinyan, former presidential candidate Andrias Ghukasyan and others. No details of the Hovannisian-Oskanian meeting are known yet. It is expected that PAP will issue a statement on the latest developments, including Hovannisian’s hunger strike, in coming days.